The Fractal Design Define R5 is the next evolution in the widely popular Define Series. Packed with intelligently designed enthusiast-oriented features delivering a silent case with powerful and expansive air and liquid cooling support, presented in a stunning Scandinavian inspired construction. 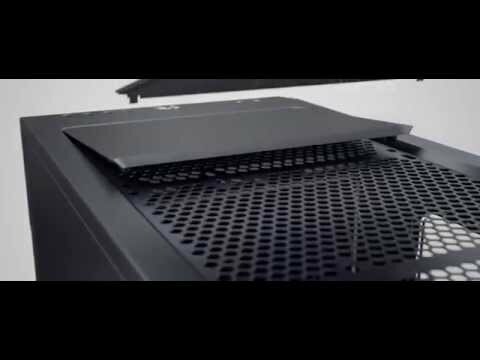 The Define R5 case reaches the highest level of silent computing through strategically placed dense soundabsorbing material, ModuVent™ fan vent covers and finely tuned Dynamic Series fans. The Define R5 was designed with configurability in mind, accommodating up to 8 hard drives and all modern graphics cards. Should you wish to expand your system with water cooling components or more fans the layout can easily be configured to meet your demand. The R5 is optimally designed for silent computing with high density noise-reducing material throughout the case for maximum sound absorption, while not compromising on airflow and cooling capabilities. The ODD cage can easily be removed to gain additional interior space; the area can be freed up to allow for increased airflow, to provide a new place for hadd cage mounting or to make more room for water cooling. Highlighting 2 dedicated SSD mounts cleanly placed behind the motherboard tray that feature innovative new brackets delivering a tool-free installation and removal. Making it even easier for you to upgrade. The Fractal R5 has room at the front, top, bottom and rear for radiators, allowing you to quiet down your GPU and CPU with liquid coolers, this also allows you to get better overclocks out of your components for better quality gaming. Fractal Design Define R5 Black Mid Tower Computer Chassis, USB 3.0, Ultra Silent Design, 2x140mm Fans, ATX/mATX/mITX is rated 4.7 out of 5 by 20. Rated 5 out of 5 by TeePee from Solid and smooth design This case is an extremely well designed and built tower. More than ample drive space in a wider than normal body allowing for cables behind the motherboard plinth, hard drives running across the body of the tower with plenty of room for data and power cables. I thoroughly recommend this case. Rated 5 out of 5 by StaySpicyAgain from Best case I've ever used This thing is seriously the best container I've ever put anything into. It's so easy to install into. And the hard drive bays made me run into the other room to show my friend. It was so good I took photos and put them on my facebook and they got exactly 0 likes. But that's fine. It is massive. I've had to put it under my bed. Get out a tape measure and see if you can live with having the ominous black slab from 2001: A Space Odyssey staring at your disappointed girlfriend for the next 2 years. 10/10, would disappoint girlfriend again. Rated 5 out of 5 by 3oin from Almost perfect I'm sure you have seen full reviews elsewhere, I only wanted to say; If this case was offered in aluminium, it would be the perfect case. Rated 4 out of 5 by PsyMonkey01 from Great Product Great case and extremely configurable and if it was not for this it would not have worked for me. I installed the Asus Maximus VIII with H115i Water Cooler but could not get the water cooler to fit at the top back of case. Had to remove the front drive bays (CD/DVD) to put the water cooler to the front top of case. Saw some people online say you can remove the plastic from the Motherboard to make it fit but did not want to damage brand new motherboard. Rated 5 out of 5 by Kevin21 from Flexible & Quiet Case Loads of options for water cooling but I wanted a quiet rig so went with a Noctua NH-D15 air cooler, leaving the modu-vents in position. Lots of room everything fitted inside nicely. I removed one of the HD cages and added an extra 140mm front fan blowing directly over the GFX card. End result is I have a very quiet rig with low temps of 68°C running prime95. Rated 5 out of 5 by Matt247 from Excellent Case Really enjoyed working with this case, the HDD cages are removable as well so you can customise. Combined with my corsair PSU, when under small load it doesn't even sound like it's on. Rated 4 out of 5 by Florian from Excellent soundproofing, room for improvement inside Great simple design, the soundproofing is excellent and may not have equivalents at this price range. Clever cable management. 4 USB ports on the front panel, which can come handy if you have various USB drives, gamepads, etc. you often plug in and out. But there are some shortcomings: it could (and should) have a no screw system for HDD and Disk drives. Here the system is exactly the same as 10 years ago. Same comment applies to side panels using hand screws, which is yet another obsolete feature. It is a very good case, but it could be even better to make it perfect. Rated 5 out of 5 by devnull from Extremely quiet Bought this for a new build - my main criteria was that the PC had to be QUIET. This is a quality case with sound deadening panels.The final PC, with watercooling and an SSD, is almost completely silent. Most impressed. - Black Edition = Black front door White Edition = White front door Titanium Edition = Titanium front door Blackout Edition = Black front door, black fans &amp; black HD caddies other than that the R5 cases are identical. Does this contain a PSU? I'm confused as many cases have &quot;no PSU&quot; in the description, but many also do not have this label. But in the specs there is nothing obvious about PSU and power rating in Watts. No PSU included with this case.